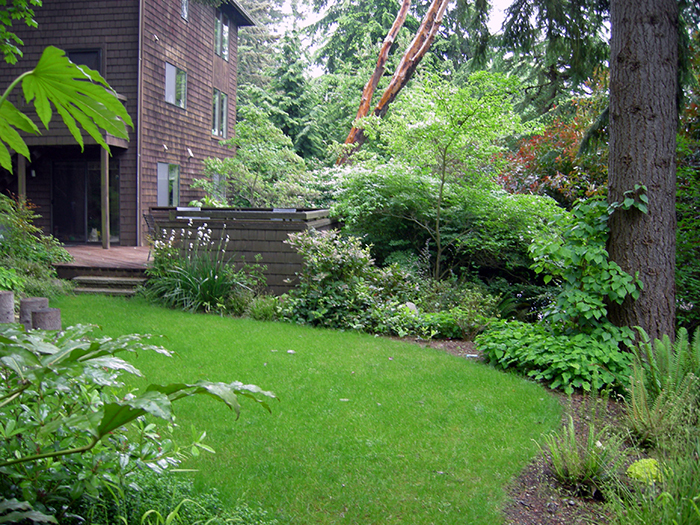 A hard-to-mow lawn sloped up to an entry crowded by overgrown shrubs. 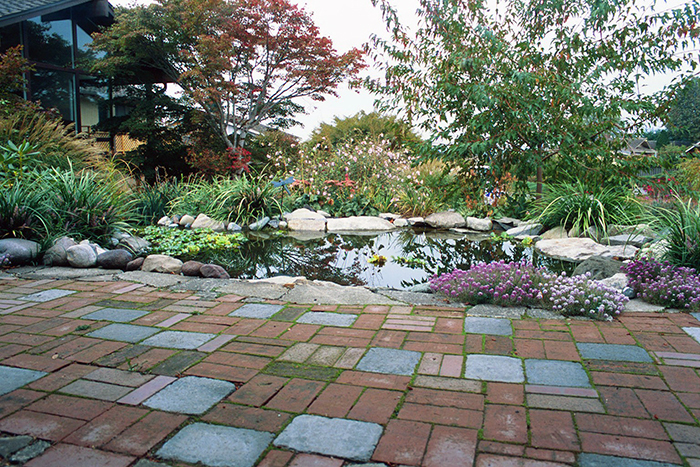 A complete remodel gave the entry a more spacious feel with the stunning addition of a pond. 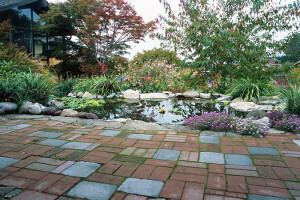 Handsome paving and textural plantings invite a closer inspection of the water and open up a spectacular view to the north. The owner himself did a fine job of installing his new landscape. 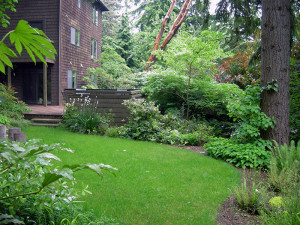 These owners, transplants from Austin, wanted colorful and grassy. 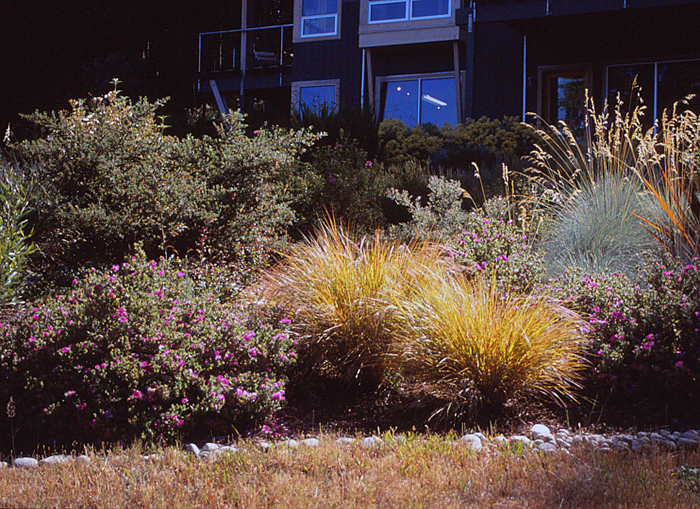 The sunny, well-drained slope in front of their new home was the perfect place for grasses and sun-loving, drought-hardy companions. The colors change by the hour and the season. With a grand view of the downtown skyline and Mt. Rainier, these owners wanted a place to enjoy it. 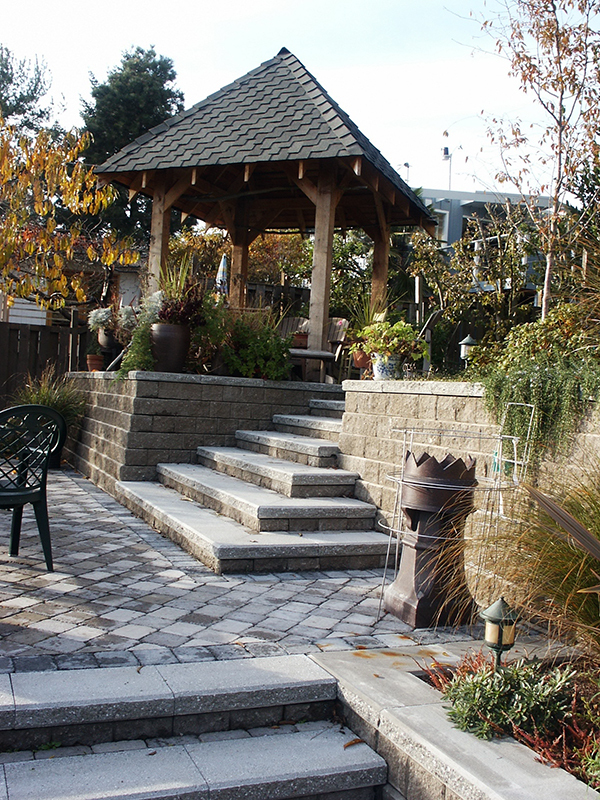 Their steep slope was tamed with retaining walls and steps, with plenty of garden beds for permanent and seasonal plants. A gazebo makes the perfect perch for enjoying coffee while taking in the vista. 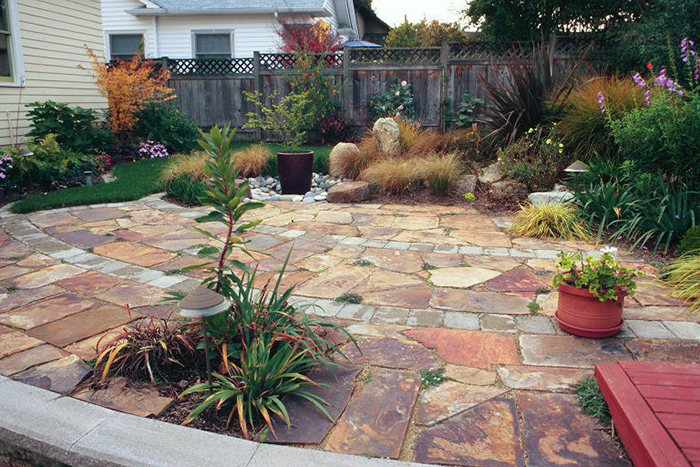 A bland backyard of lawn and overgrown shrubs now features a striking flagstone patio with water feature. 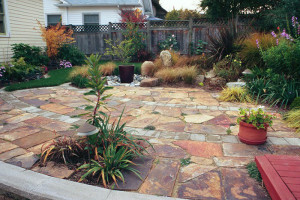 Paving connects to a rooftop deck over the garage and drought-hardy plantings give year-round color with minimal upkeep. 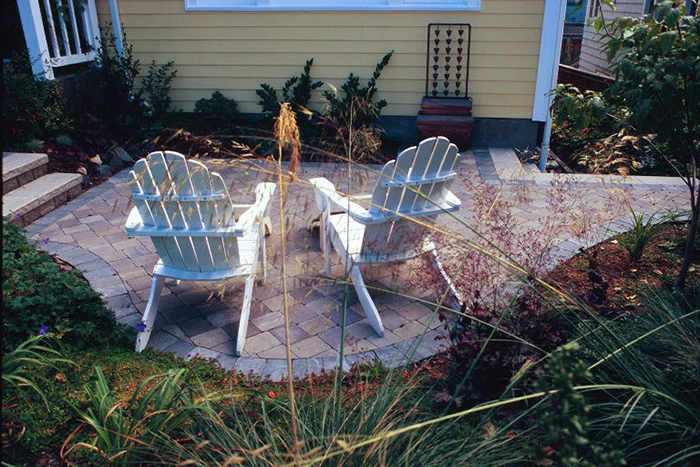 A large paver patio is tucked in between the slope and the sunny side of the house. Large boulders form a retaining wall, now covered in a great variety of low-water plants giving color and fragrance – and hummingbirds – year-round. The wooded setting was lovely, but the forest was closing in on the house, limiting sunlight and outdoor activity. The vegetation was gently pushed back, making space and light for grass and beds of low-maintenance plants that give all-year interest. 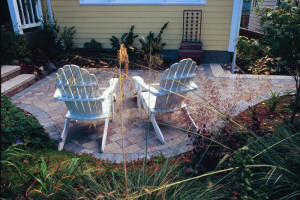 The south side of their house was too hot in summer to sit out comfortably, so this little paver patio was the answer. 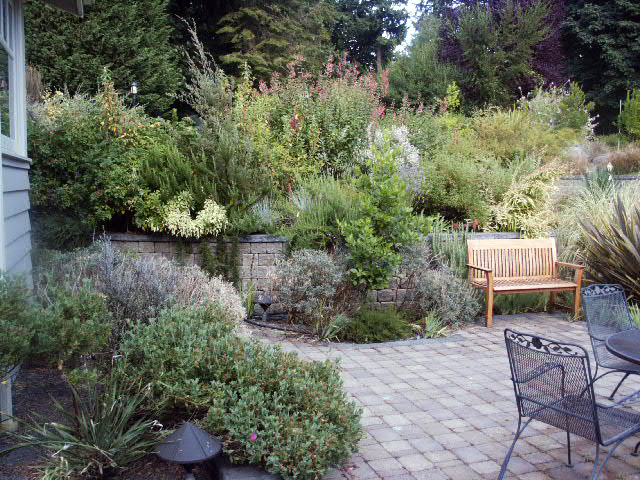 Concrete wall blocks hold up the slope decoratively and drought-hardy shrubs give all-year color and privacy. A steep, sandy slope was nearly impossible to traverse, let along garden on. 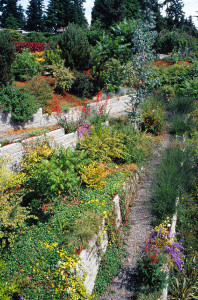 Now, a zig-zag of retaining walls holds the slope and carries a path gently down, with pockets of planting beside the walls and in the hollows in the wall itself. 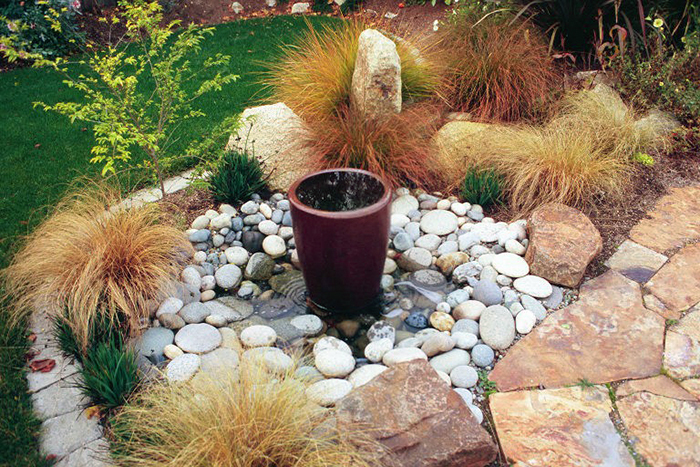 A variety of drought-hardy plants gives color, texture and fragrance all year long.